The World's Cleanest, Quietest, Easy To Use Mill! Imagine your favorite recipes made with the great taste of 100% whole grain goodness and all the nutrition from every grain. 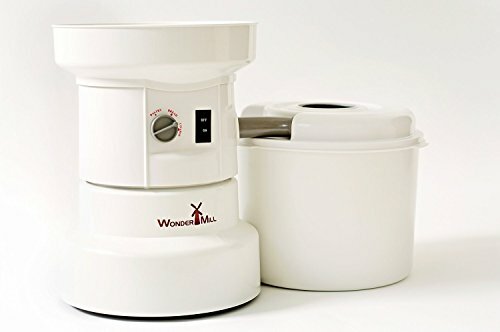 The WonderMill is the quietest and fastest flour mill available. You can create super fine flour or coarse flour at temperatures that preserve nutrients, ensuring that you will always have the perfect flour for your food. The WonderMill has the capacity to perform big jobs. You can grind over 100 pounds of flour in an hour. You don't have to worry about overloading the WonderMill because of it's large 1 3/4 hp motor. The WonderMill will not only grind wheat, rice and other small grains, but will also grind legumes and beans as large as garbanzos. The WonderMill is extremely easy to use. Simply fill the hopper and you'll get flour. There are no small parts to misplace, and cleaning the WonderMill is quick and easy. A lifetime warranty is included with every WonderMill from the company who has been making this quality mill for over 10 years. Includes - Every WonderMill product comes along with a LIMITED LIFETIME WARRANTY!